Parents are usually astounded by how much “stuff” one needs when you go on an afternoon outing. It’s almost triple the amount of “stuff” required when planning for a vacation with babies and toddlers. You need a car seat, stroller, tons of clothes, toys, books – and then loads of diapers, wipes, sunscreen and baby food…. You’re taking a lot of “stuff “that you have to lug around (plus you have to pay baggage fees with most airlines). JetSetBabies was manifested to help parents feel cool, calm and “stuff-free” when Jetsetting. New owners Tiffany Cohen and Nancy Horn are putting the “free” back into freedom to help parents travel “stuff-free” by shipping directly to their travel destination. New Web Site re-launches to offer easier access to baby travel supplies, improved user friendly dashboard, greater variety of baby Items, and all Inclusive travel supply packages tailored to individual travel destinations that simplify over all planning. All products are delivered straight to the door of your travel destination. *Coming soon, there will be an option to get items “Before You Go” – (i.e. activities for kids, CARES safety Harness, travel carts, portable booster seats for vehicle travel). JetSetBabies offers convenient vacation packs for the beach, Disney Parks, ski slopes…etc. Each vacation pack is customized with your child’s diaper size and offers enough diapers to keep your child dry, as well as disposable changing pads and wipes. You even have the choice to pick what brand of diaper you like (Seventh Generation is an option). 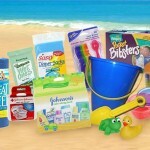 You just need to add formula (if you use it), baby food, snacks, sunscreen, etc… then check out and you are ready to go! ● Travel pack of wipes containing 12-16 wipes (depending on the brand), two swim pants singles, and a 1 oz. Coppertone water babies sunscreen. Size 1 packs contain 10 diapers, size 2 contains 9 diapers, size 3 contains 8 diapers, size 4 contains 7 diapers, and sizes 5 and 6 contain 6 diapers each. This entry was posted on Monday, November 25th, 2013 at 3:55 pm	and is filed under Blog. You can follow any responses to this entry through the RSS 2.0 feed. Both comments and pings are currently closed.